It’s hard not to swoon over this countryside wedding in Tuscany. We wanted Kathleen and Gaetano’s invitation design to reflect the romantic, rustic surroundings, so we created a neutral white and brown palette, subtle florals, and beautiful calligraphy by Tara Jones. The wedding day, set in the garden with dusty tones of blush and pink and the perfectly weathered Villa Vignamaggio in the background, just looked incredible! Working with this client was extra special because the bride was an old college friend of Lesley’s – plus the wedding took place in Italy – double fun! 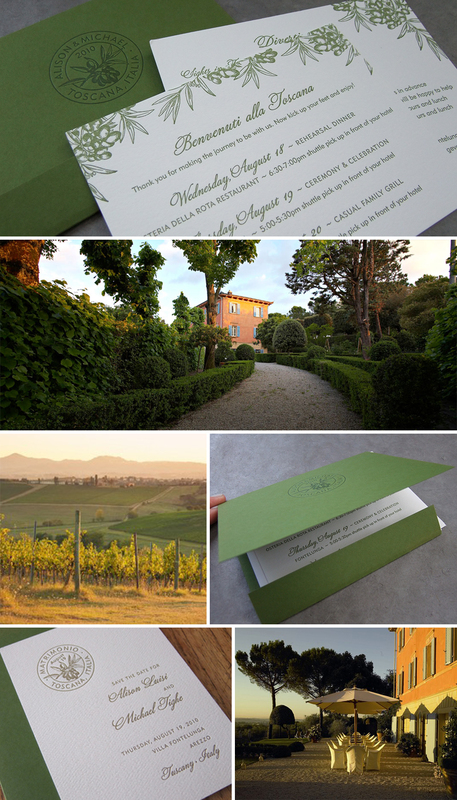 Alison tapped into her Italian roots and planned her summer wedding in the hills of Tuscany. Set in a gorgeous villa surrounded by olive trees and vineyards, we highlighted the flora of the area in all of the printed pieces.